We hope the new video will help you reminisce about what we’ve seen of the season so far–and about how far the BA litter and Driver have come, not to mention Paper! Paper has blossomed so far this year and we hope to hear more from him during the formal season. Thanks to the Hound Welfare Fund, all the canine stars of this highlights video can expect a peaceful, dignified retirement. They give us great enjoyment while they’re members of the working pack, and we value every one. As we prepare to celebrate these magnificent animal athletes at the Blessing of the Hounds, please consider helping the Hound Welfare Fund provide for the hounds in their golden years! 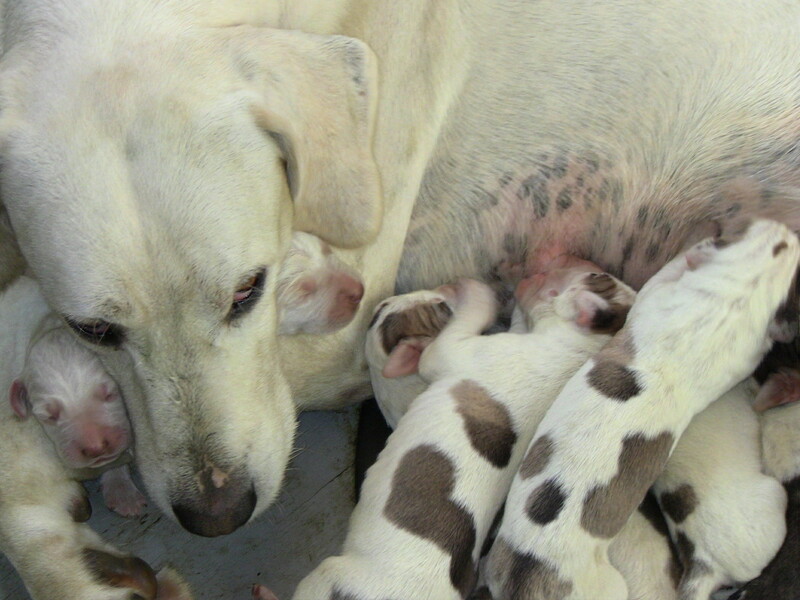 BORN just in time for St. Hubert’s Day and the annual Blessing of the Hounds, which kicks off the formal season, Baffle had 11 puppies. You read that right: there are 11 (or five and a half couple, as they’ll eventually be counted), almost enough to start a new pack! These are by Hawkeye, who, like Baffle, is an import from England. Baffle and Hawkeye both are from the Cottesmore hounds. 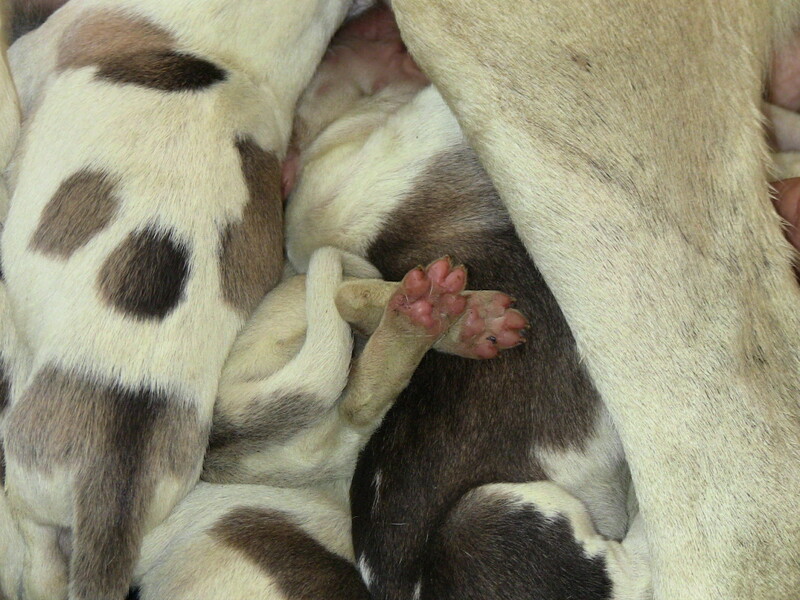 Baffle started to whelp on Friday night, and the last of the puppies was born on Saturday morning. Mother and puppies are doing well so far, and we are looking forward to following their adventures as we have those of Baffle’s first litter for Iroquois, the BA litter who are now in their first season with the working pack. And doing extraordinarily well, we should add! An interesting side note: because there are already so many BAs (Baffle’s first litter was nine puppies strong), it looks likely that this litter will not have names starting with BA, the first two letters of their dam’s name, as is the usual custom. Instead, to prevent confusion from so many BA names, they’re more likely to be named with HA, for their sire. In which case, we humbly suggest one name for consideration, considering their birthdate: Halloween! To see about 20 second of adorable puppiness—more than 20 seconds would risk cute overload–click on the video below. Congratulations, Baffle and Hawkeye! The Iroquois Hunt's Blessing of the Hounds honored the pack's retirees as well as its current hunting members. The human "new entry" also were well represented among the riders! THERE’S something truly beautiful about the Blessing of the Hounds ceremony that opens the formal foxhunting season. 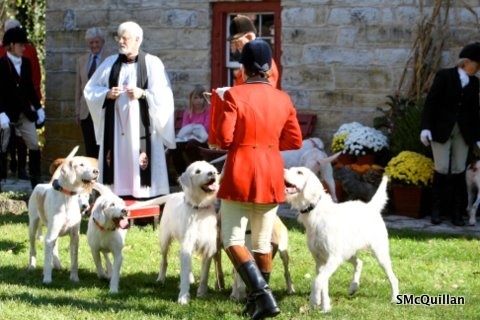 It’s a “high church” event for foxhunters, a way to honor the sport’s most important players: the hounds, the game, and the land. 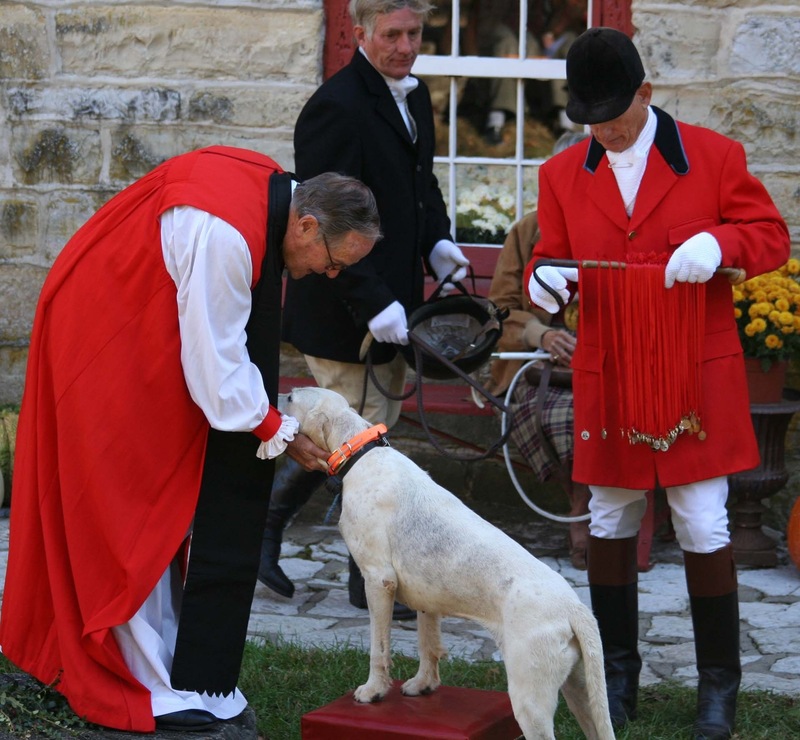 At Iroquois, we add a special twist by including retired hounds in the blessing ceremony, a tip of the top hat to their years of service and all the sport they and their progeny have given the club. A good many of the Iroquois Hunt’s neighbors and landowners were in attendance today as the riders, horses, hounds, and hunt staff gathered in toasty sunshine on the clubhouse lawn. Deacon Bryant Kibbler conducted the service, and in his brief homily, he, too, made a point to honor our old soldiers who were standing nearby with huntsman Lilla Mason, their sterns gently waving as if they were remembering their glory days in the hills and fields around them. They were joined by a sprinkling of current members in the hunting pack. Our big woolly, Grundy’s son Sassoon, is “far from retired,” Lilla said, “but he loves a party.” The sisters Finite and Finesse, fondly known as “two bodies, one brain,” also attended before taking to the hunt field. They are a testament to this hunt staff’s patience. They showed little real interest in hunting early on in their careers and usually could be found loping along together as if in their own world. But one day, something clicked. But there they were, the two sisters leading the whole pack. Sassoon, Finesse, and Finite are all woolly hounds rather than smooth-coated. The other woollies out this morning to receive their blessing were Gloucester, Fickle, and Stalker. For Stalker, it was an especially important milestone. Stalker is nine years old this season, and he has a heart ailment. “Every day is a blessing for Stalker,” said Lilla, and that’s true. We don’t know how long we will have old Stalker around, but he has earned the hunt’s special affection for his courage. The other retired hounds who enjoyed a nostalgic visit to the hunt club were Parapet, Pancake (better known in her early hunting days as “Pancake. Pancake. PANCAKE!”); Glamorous, so named because she appears to be wearing an ermine wrap around her neck and shoulders; Radiant; Glowworm (whose father, Captain, was the first hound retired under the auspices of the Hound Welfare Fund); and Harlequin, the HWF’s retiree of the year for 2009 who was featured in the blog earlier this year. The clip below is from the beginning of the Blessing of the Hounds ceremony; the two biggest woollies are Sassoon and Stalker. Then it was on up the road for a stirrup cup in a field adjacent to Miller Trust Farm, where the hounds are kenneled. It was especially nice to see so many young riders out today! They took everything in stride. The smallest riders retired from the field after having their photos taken (and some ham biscuits and cake, provided by Lilla as part of the stirrup cup). But the other juniors joined right in for the hunt day, galloping and jumping and watching the hounds work in the grassy fields, woods, and creek bottoms on Miller Trust and the surrounding country. We think everyone–hounds, horses, and riders–went home happy. The weather was too hot for good scenting, but the hounds worked well together, and, all in all, it was a pleasant start to the formal season, complete with some impromptu schooling over fences in “the bowl” near Boone Creek on Miller Trust. In the clip below, you get a good idea of how high some of the growth is now, courtesy of the unusually wet summer we’ve had. The clip starts with the field jumping a coop and also includes the sound of Lilla’s horn and the hounds speaking briefly. Finally, it was time to hack home again. Lilla rode her horse, Lager, right into the kennel to make sure everyone was home safely. We hope you had a happy hack home, too. The end of the day. We hope you enjoyed it as much as we did! Bonfire received a personal blessing at the 2008 Blessing of the Hounds. The St. Hubert's medals, which the riders receive at the Blessing, are being readied to the right. 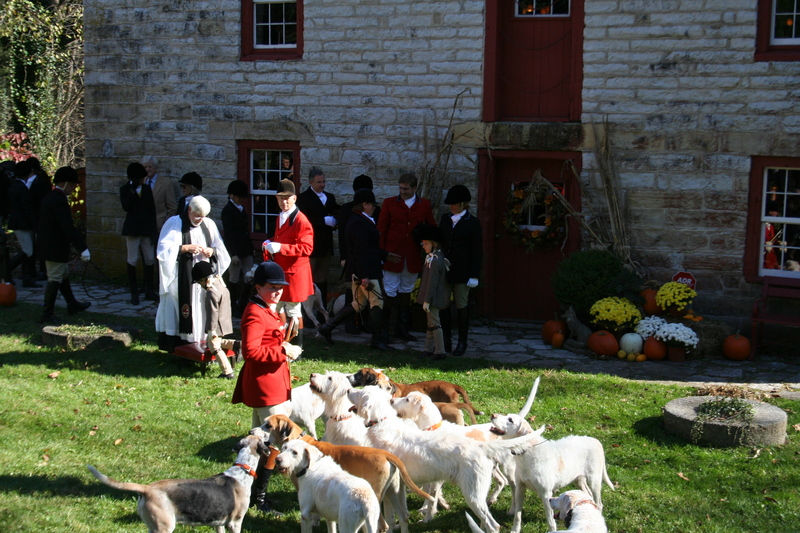 AT Iroquois, the formal hunting season traditionally opens with the Blessing of the Hounds on the first Saturday of November. That puts it close to the Nov. 3 feast day of hunting’s patron saint, St. Hubert of Liege (circa 656-circa 728), a huntsman himself. The Blessing of the Hounds isn’t, of course, unique to Iroquois or even to foxhunting. In Belgium, where Hubert was Bishop of Liege, the Blessing of the Hounds (and their huntsmen) is mainly a ritual to ward off rabies, because the saint was famous for curing the dread disease using either (or both) of two tools: thread from a white and gold stole the Virgin Mary was said to have bestowed on Hubert and the St. Hubert’s Key, supposedly given to Hubert by St. Peter. Both were used up even into the modern age by monks in the Brotherhood of St. Hubert. The thread cure involved making an incision in the skin of the sufferer’s forehead, then placing the thread in the wound. The key cure wasn’t much better, according to this account: “A priest would prick the forehead of a rabies sufferer and a black bandage would be applied for nine days while the heated key was placed on the body where the bite had occurred. This could actually help, because if the heated key was applied immediately it could cauterize and sterilize the wound, effectively killing the rabies virus.” To see a picture of the key, which was used in some parts of Europe even up to the 20th century, click here. The Brotherhood of Saint Hubert, or Compagnons de Saint-Hubert, is headquartered in the small Ardennes town of Saint-Hubert (surprise! ), where they put on a really big show for their Blessing of the Hounds. 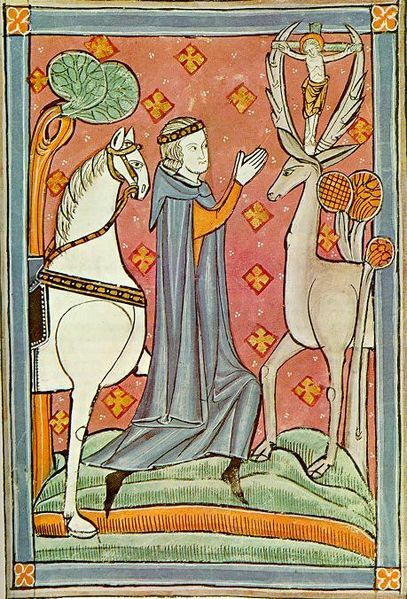 St. Hubert: prince, huntsman, healer, and saint. He is the patron saint of hunters, but other groups that also claim him include butchers, machinists, mathematicians, and metal workers. “Every year on November 3rd the green-cloaked Compagnons de Saint-Hubert proceed to the basilica followed by the scarlet-coated hunters with their hounds, the sonneurs carrying huge circular hunting horns over their shoulders, the flag-throwers, and–this being Belgium–a solid contingent from the brewers’ guild. During the High Mass, hounds stand next to hunters in the nave, good-naturedly waving their tails and tilting their heads in recognition whenever the service is punctuated by the refrain of the hunting horns, whose chords reverberate amid the soaring columns. The sound disturbs something primordial; it is impossible to remain unmoved. It’s customary to eat bread (variations on the Blessing of the Hounds often have the hounds and hunters eat bits of blessed bread as protection from rabies), as well as other traditional game dishes. 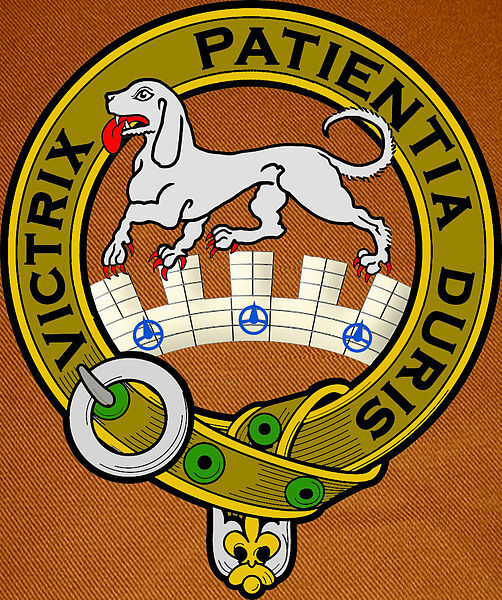 In addition to being the patron saint of hunters, he also has been associated at one time or another with furriers, trappers, mathematicians, metal workers, and machinists, and he is invoked against both rabies and bad behavior in dogs–especially in hounds and other hunting dogs (Harry and Driver, meet Hubert!). Hubert may have given up all his worldly possessions, but he didn’t give up his love of hounds, and the monks of the St. Hubert abbey honored this by naming a breed of hound they developed the “chien de Saint-Hubert”: Saint Hubert’s hound. The breed originally is thought to have been all black or black and tan, medium-sized, and smooth-coated, a forebear of the bloodhound and others. The modern version, seen below, looks very like the bloodhound, but some historians believe today’s version differs significantly from the original bred by the Belgian monks. Some say the originals were powerful but shorter-legged than their modern brethren, and principally valuable in hunting boar. The bloodhound and modern St. Hubert’s characteristic loose, wrinkly skin also, one hound breed historian noted, “was not at all typical of the St. Huberts of the Abbey.” Others say that the modern bloodhound was developed by crossing black St. Hubert’s hounds with white Talbot hounds, the latter a large early hunting hound, now sadly extinct. The Talbot hound. Now extinct, this large white hunting hound features in medieval paintings, stone carvings, and coats of arms. Given the passage of so much time, it’s difficult to know exactly what the originals looked like. It is usually said that William the Conqueror first imported the St. Huberts to England, calling them bloodhounds. “Probably the most direct importation of St. Hubert’s hounds into Great Britain was the present of a pack of hounds made to the monks of Margam Abbey in Glamorganshire. The tradition is that these hounds were presented by the monks of some continental abbey, presumably by St. Hubert’s Abbey itself, as I have failed to trace any other monastery that bred hounds. In any case, these hounds are traditionally reputed to have been of St. Hubert’s breed, smooth-coated and black and tan in colour. They were kept and bred at Margam Abbey until the dissolution of the monasteries under Henry VIII, when they passed into the hands of the Lord of the Manor and later, about 1700, the descendants of this pack become the property of Mr. Jenkins of Gelli. The gene that makes some of the Iroquois hounds woolly is Welsh, so could our woollies like Sassoon hark back to St. Hubert? It’s awfully nice to think so, especially today, on St. Hubert’s feast day.